Looking to give Vertu a run for its money, Tag Heuer has upped the ante with its newest, limited-edition MERIDIIST Automobili Lamborghini phone. 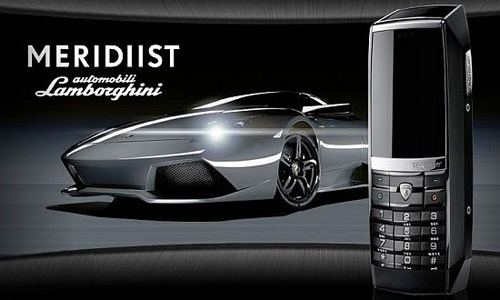 The MERIDIIST Automobili Lamborghini phone is luxuriously crafted and detailed, marrying the most prestigious materials and advanced components in the watchmaking and automotive worlds. The display is made from 60.5 carats of scratch-resistant sapphire crystal. The back of the device is engraved with its limited edition number (only 1963 pieces available worldwide to tribute the year Lamborghini was founded) while the keyboard is customized with Lamborghini’s trademark Taurus bull on the central button. “TAG Heuer has revolutionized first timekeeping and now luxury mobile phone industry by finding technological inspiration in professional motor sports and Grand Tourism cars,” said Steve Amstutz, General Manager for TAG Heuer Communication Instruments. Built by ModeLabs, the TAG Heuer MERIDIIST Automobili Lamborghini also features a scratch-resistant sapphire crystal display, 2MP camera, 2GB of internal memory and a battery that can last up to7 hours in talk time mode, or up to 28 days in standby. The new luxury phone is available at selected TAG Heuer and Lamborgini retailers, which we’re sure you frequent anyway.